Central’s Kevin Fitzgerald won through the latest round of the County singles, beating Falcon BC’s Andrew Squire 21-20 in a tense match on Monday that lasted over two hours. 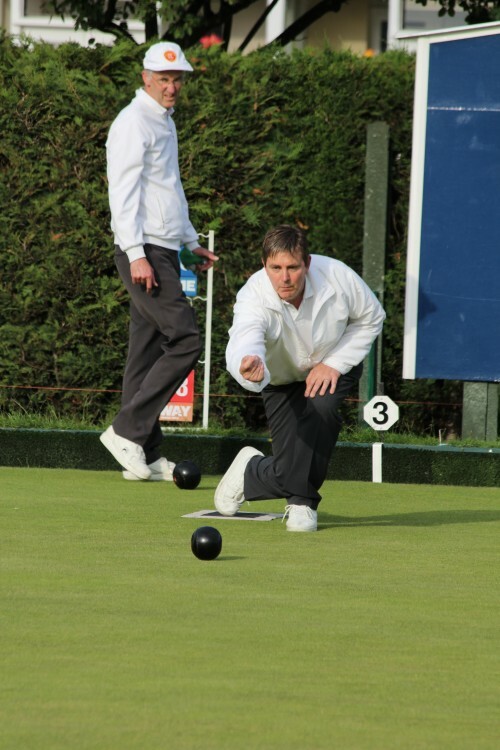 Squire, one of the County’s foremost bowlers, took an early lead in the first few ends, but Kevin clawed this back, and for the middle section of the game the scores were pretty level. It wasn’t until the 18th end that there was decisive swing in the Central player’s favour. Three shots on that end gave him a 18-15 lead. Squire countered with two shots on the next, then they traded singles in the next few ends. At 19-18 Squire upped the pressure and was on at least one occasion holding game, but a few key woods from Fitzgerald and couple of occasions where woods fell in his favour meant that the game went down to the wire at 20 all. On what was to be the final end Squire again put the pressure on straight from his first bowl which finished little more than a foot directly in front of the jack. Another tight head ensued with Squire making Fitzgerald’s job more difficult with more well placed short woods. Then Squire’s final wood of the end made the jack visible again. This spurred Fitzgerald into playing a little weight and he managed to find a way through two short woods to trail the jack and count the single he needed to win the game. Fitzgerald continues Central’s good form in the County singles over the last few years, and goes on to play Mark Wilson of local rivals Ilford in the quarter finals of the competition. ~ by Colin Foster on June 24, 2013.